A bathroom is one of the most common places to remodel in a home. If your client’s current bathroom could use a makeover, ProSource® showrooms are a great resource. At our showrooms, you will be given a full view of what are the latest trends in bathroom remodeling. You will be able to browse new techniques and design ideas, while utilizing lessons from experts in the field. Our showroom will not only offer you the materials for your project, but the knowledge to see the remodeling job completed successfully. 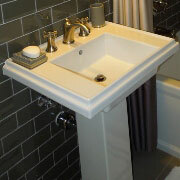 If you are looking to spruce up your client’s bathroom, a new sink is one of the best ways to do so. With a new sink, your client’s bathroom could transform into a better, more inviting place of sanctuary. Visit your local showroom for the latest in designs and installation information. Bathroom sink faucets and new sinks go together. Meaning, if you get a new sink basin, you will need a new faucet. 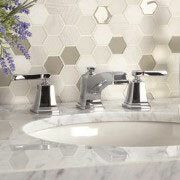 Our showroom has dozens of faucets to choose from, ranging in style, size, as well as material. The shower can be one of the best features of your client’s home. At our showroom, you will be able to learn new ways to enhance your client’s shower experience. Stop by and learn from one of our on-staff professionals. 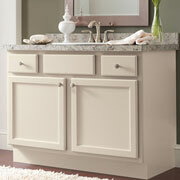 Vanities are a great way to optimize storage in your client’s bathroom. Instead of relying on overhead storage spaces or hallway closets, a vanity makes storing items, such as towels and beauty products, much easier. If you think your bathroom remodel could benefit from a vanity, our ProSource showroom has dozens of different styles in a range of materials and colors. After a long day, sometimes, a nice bath is the best form of “medicine.” But, if your client is currently struggling with an outdated or cramped bathtub, perhaps a remodel is in order. 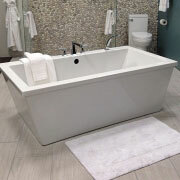 Come to our showroom and view our selections of bathtub models. 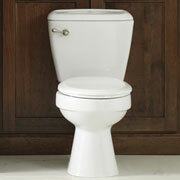 A poor-functioning toilet can be a homeowner’s worst nightmare. If your client’s toilet has had a long life but threatens dysfunction, perhaps purchasing a new model would be beneficial to them. At our showroom, you will be able to browse the different types of toilet models and see which one would work best for your client’s home.